Call Today for Antique Restoration! "Don't worry, we can fix it"
Furniture Repair Specialists of Chapel Hill, NC & Raleigh, NC are a full service shop specializing in the appropriate repair, restoration, and refinishing of antiques, fine furniture and pianos. Our shop is fully equipped to handle any kind of restoration of wood objects, as well as wood veneer. We have experience in antique restoration, fine furniture restoration and piano restoration. We are also a provider of commercial services that include trim and door repair, and have experience in working for both local and national companies. Our experienced staff has knowledge of furniture refinishing and furniture repair. We have a passion for great furniture and we know the feeling of having your favorite piece damaged. If you have an old antique piece we can provide furniture refinishing to make it like new. Don't replace old furniture that has character, with a new generic mass produced furniture piece. Let our furniture refinishing experts transform that old piece into something new. 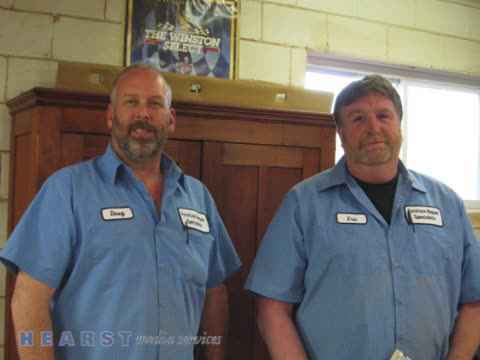 Doug Witham and Eric Steffenhagen have been restoring and repairing furniture for customers in the Triangle Area for more than 15 years, and have earned the respect of many for their excellent workmanship. They have literally worked on thousands of pieces over the years. Your fine furniture and antiques will be handled with the greatest of care by these seasoned restoration experts. No renovation project is too large or too small for us to handle. Call us for furniture repair and antique restoration needs. We have the ability to bring back the former glory of your old woodworks and pianos. We can repair, refinish and restore just about any furniture pieces that you bring to us. We take pride in our ability to restore the brilliance, luster and integrity to your damaged and worn furniture. We can expertly repair structural damages to furniture legs, arms, backs and cabinets. We are able to properly remove minor scratches and dents from all types of wood furniture. No matter the wear and damage that your furniture has experienced, we can restore it to the condition that it was previously in. There is a right and wrong way when it comes to antique restoration. The experts at Furniture Repair Specialists know the proper techniques and methods to restore your antique pieces while retaining their originality and character. We are restoration specialists in Raleigh, NC. Since 1993, the people of Raleigh have trusted Furniture Repair Specialists with their furniture and antique restoration needs. We have continuously worked to gain a reputation as the leading wood restoration and refinishing service in the area. Our shop is fully equipped and our staff is able to handle any type of wood restoration, including wood veneer restoration. Our veneer replacement and repair is second to none. We offer a vast array of restoration and repair services that range from complete furniture repair to refinishing to modifications. We are experts in the restoration of antique and contemporary furniture, refinishing projects and the creation of modification pieces. We provide in-home piano refinishing, touch-ups and repairs. Furniture Repair Specialists is the answer for all of your furniture restoration needs. We are experienced, reliable and can bring your furniture pieces back to life. We offer in-home piano restoration and refinishing services. Call Furniture Repair Specialists to schedule an in-home piano restoration. We will return your piano back to its proper condition, completely restoring its cabinet and finish, both inside and out. We aim to exceed the expectations of our customers. For more information on our services, give us a call at 919-233-3500. We’d be glad to answer any questions that you may have about the services that we offer. You can view examples of our work at our shop, located at 6009 Chapel Hill, NC in Raleigh, NC.